An introduction to Alyson and Dave Sheldrake. Alyson is an artist and the founder and editor of this site and Dave is a professional photographer and they both live and work here in the Algarve. The First Edition – Autumn 2017 is now live. Click here! 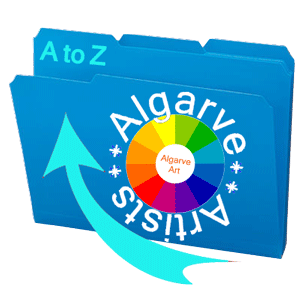 Our free A to Z listing of Algarve Artists. Feel free to browse the pages – and find new art to enjoy – and artists to contact. Click the image above or the link here to view our exclusive A to Z free online publication. © 2019 The artists featured in this website all retain the full copyright for their own work. Articles or images may not be downloaded, reproduced, copied, projected or used in any way without the express written permission of the artist concerned and/or Algarve-Art. All Rights Reserved.